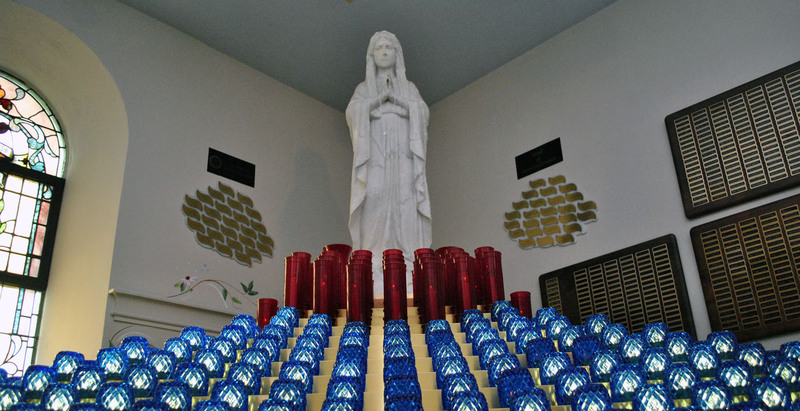 The Votive Light Shrine is located in Alumni Chapel on the campus of Niagara University. 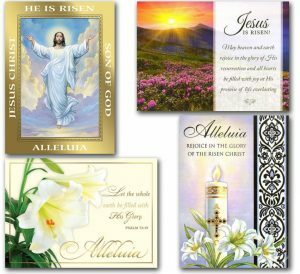 We have Easter Enrollment Cards available to remember your loved ones in three Novenas of Masses celebrated during the Easter season. The Masses are celebrated by the Vincentian Fathers for Our Lady of Angels Association. The Vincentians of Our Lady of Angels Association offer twelve annual Novenas of Masses. The next Novena of Masses, Easter, begins on Easter Sunday. Please send your intentions and we will remember them in these Masses. 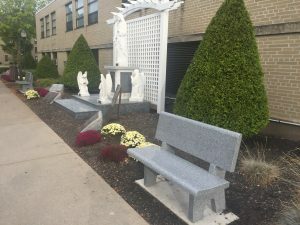 We have added four new beautiful granite benches at Our Lady of Angels Shrine on the campus of Niagara University. We have 2 benches left available for inscriptions. The offering for each bench is $5,000. You may have your personal inscription placed on each bench, e.g. “In Memory of…” or “In Honor of…”. The names listed on the benches, as well as the donors, will share in the spiritual benefits of the many Masses and prayers of the members of the Vincentian Community. Please contact the office at 1-800-575-9956 for questions or more information. Through your generous support of Our Lady of Angels Association, you can help Vincentian priests and brothers to make a difference in the lives of thousands and thousands of people. Your generous donations will be put to use both in the United States and in foreign missions. 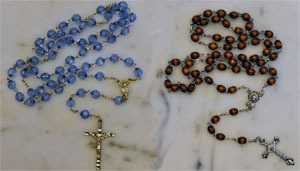 The Vincentians of Our Lady of Angels Association offer 12 Novenas of Masses for those enrolled in our Association. Those enrolled are also remembered in the prayers of the Vincentian Community. The heavens declare the glory of God; the sky proclaims its builder’s craft. One day to the next conveys that message; one night to the next imparts that knowledge. There is no word or sound; no voice is heard; Yet their report goes forth through all the earth, their message to the ends of the world. God has pitched a tent there for the sun; it comes forth like a bridegroom from his chamber, and like an athlete joyfully runs its course. From one end of the heavens it comes forth; its course runs through to the other; nothing escapes its heat. May the glory of the Lord endure for ever; may the Lord be glad in these works! If God glares at the earth, it trembles; if God touches the mountains, they smoke! I will sing to the Lord all my life; I will sing praise to my God while I live. May my theme be pleasing to God; I will rejoice in the Lord. May sinners vanish from the earth, and the wicked be no more. Bless the Lord, my soul! Halleluia! Hasten to answer me, Lord; for my spirit fails me. Do not hide your face from me, lest I become like those descending to the pit. At dawn let me hear of your kindness, for in you I trust. Show me the path I should walk, for to you I entrust my life. Rescue me, Lord, from my foes, for in you I hope. Teach me to do your will, for you are my God. May your kind spirit guide me on ground that is level. For your name’s sake, Lord, give me life; in your justice lead me out of distress. In your kindness put an end to my foes; destroy all who attack me, for I am your servant. Let your love come to me, Lord, salvation in accord with your promise. Let me answer my taunters with a word, for I trust in your word. Do not take the word of truth from my mouth, for in your edicts is my hope. I will keep your teachings always, for all time and forever. I will walk freely in an open space because I cherish your precepts. I will speak openly of your decrees without fear even before kings. I delight in your commands, which I dearly love. I lift up my hands to your commands; I study your laws, which I love. Indeed, the grace of our Lord has been abundant, along with the faith and love that are in Christ Jesus. This saying is trustworthy and deserves full acceptance: Christ Jesus came into the world to save sinners. Of these I am the foremost. But for that reason I was mercifully treated, so that in me, as the foremost, Christ Jesus might display all his patience as an example for those who would come to believe in him for everlasting life. To the king of ages, incorruptible, invisible, the only God, honor and glory forever and ever. Amen. We do not want you to be unaware, brothers, about those who have fallen asleep, so that you may not grieve like the rest, who have no hope. For if we believe that Jesus died and rose, so too will God, through Jesus, bring with him those who have fallen asleep. Praise the Lord from the earth, you sea monsters and all deep waters; You lightning and hail, snow and clouds, storm winds that fulfill his command; You mountains and all hills, fruit trees and all cedars; You animals wild and tame, you creatures that crawl and fly; You kings of the earth and all peoples, princes and all who govern on earth; Young men and women too, old and young alike. Let them all praise the Lord’s name, for his name alone is exalted, majestic above earth and heaven. The Lord has lifted high the horn of his people; to the glory of all the faithful, of Israel, the people near to their God. Not to us, Lord, not to us but to your name give glory because of your faithfulness and love. Why should the nations say, “Where is their God?” Our God is in heaven; whatever God wills is done. Their idols are silver and gold, the work of human hands. They have mouths but do not speak, eyes but do not see. They have ears but do not hear, noses but do not smell. They have hands but do not feel, feet but do not walk, and no sound rises from their throats. Their makers shall be like them, all who trust in them. In you, Lord, I call; my Rock, do not be deaf to me. If you fail to answer me, I will join those who go down to the pit. Hear the sound of my pleading when I cry to you, lifting my hands toward your holy place. Do not drag me off with the wicked, with those who do wrong. Who speak peace to their neighbors though evil is in their hearts. Blessed be the Lord, who has heard the sound of my pleading. The Lord is my strength and my shield, in whom my heart trusted and found help. So my heart rejoices; with my song I praise my God. 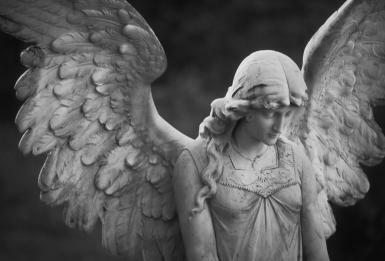 You can rest assured that Our Lady of Angels Association respects your privacy and does not rent, sell or lend your name or email to other organizations.